Urd isn’t sure she believes her mother’s explanation that a powerful spell is what caused Urd to be conceived. Hild tells her daughter (along with Skuld and Ansuz) that the spell was stronger than the rules, but with tighter restrictions. Ansuz realizes that with this comes a higher penalty, so while Hild’s spell allowed her to meet with Tyr one single time, should they accidentally meet again, Hild would die as a result. Tyr is telling the same story to Belldandy, Keiichi, and the Lake Goddess. When asked why he didn’t stop her, Tyr said that when she transferred to heaven to see him, it was already too late. Hild used some kind of magic on Tyr at the time, and though he was glad he saw her, he can never see her again. As such, he didn’t want Belldandy and Keiichi to go through the same experience. Belldandy thanks her father, the Lake Goddess, Skuld, Urd, her mother, and of course Keiichi, for all they’ve given her in terms of love and courage. With that, Keiichi unlocks the gate. Belldandy says a goodbye greeting that Tyr says a daughter about to get married should not be saying. Belldandy ponders this for a moment, then gives the traditional (?) goodbye of a bride leaving her father’s home. Before they leave, Tyr tells Keiichi that he’s sure that Keiichi will return to see him. Keiichi denies this. The two depart through the gate, leaving Tyr with Lake Goddess. She notices Tyr crying, which he denies and then departs from the body of the Judgement Gate. Judgement Gate is freaked out by the water coming from her eyes, the return gate being open, and a mysterious goddess in her presence. Back in hell in the waiting area, Skuld wonders why Hild would go so far, leading Hild to tease her. Urd wonders she would ever love someone so much to do such a thing. Ansuz scolds Hild for doing such a selfish act since Hild’s death would weigh heavily on Tyr. Ansuz says Tyr is already in a lot of pain because of Hild, to which Hild angrily retorts that she’s in pain too and that she’s going to destroy the system. Ansuz calms down, saying there is one good thing about Hild’s otherwise unforgivable act — the birth of Urd. Further, she says that the system doesn’t need to be destroyed as it can be overcome, citing the arriving Belldandy and Keiichi as proof. Well, I guess Belldandy and Keiichi are finally going to be married. Yay! I’m not 100% certain, but I’m pretty sure that Belldandy’s parting words to her father are the traditional Japanese words spoken by a woman leaving home to get married. 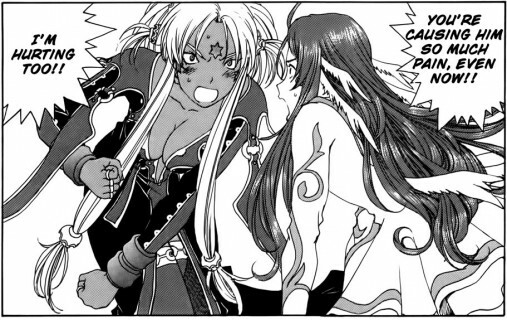 I like that Fujishima-sensei has finally told the story of how Hild and Tyr were able to have Urd conceived. Although it wouldn’t fit into this story, a side story telling how the two met and fell in love would be something I’d have some interest in. I was amused by this whole weird relationship that Hild and Ansuz have. Hild is the one who broke the rules in order to have one night with the man she loved, and should she see Tyr again, she dies. As I see it, Hild still loves Tyr and Tyr still loves Hild. Yet Tyr is married to Ansuz, and I presume he loves her. Yet Ansuz’s anger at Hild isn’t rooted in jealousy, but in how Hild’s reckless actions could cause Tyr more pain and suffering. With Keiichi and Belldandy having survived the gate, I guess it is time for them to return to Earth and get married, eh? Hopefully, I can read the next chapter (actually, I think 305 has come out in Japan) fairly soon, but that seems unlikely. Chapter 304 English translation has hit the net as well as news that the series is ending this year. She is Belldandy’s mother after all, caring more for the others than for herself.